The first song on this list of best Legend of Zelda themes is the main theme from the latest console Legend of Zelda game, Skyward Sword for the Wii. Regardless of what one thinks of the game and its motion controls, one point that cannot be denied is that the soundtrack is something special, offering for the first time a majority of tracks featuring real world instruments instead of synth. Ballad of the Goddess is notable for not only being an excellent theme, but it's essentially Zelda's Lullaby played backwards, which is amazing that that famous song still works so well even backwards! After the third dungeon of The Legend of Zelda: Twilight Princess, the evil Zant weakens Midna to a critical state. Thus, it's up to Link in his wolf form to get Midna back to Zelda so her health can be restored. All the while, in a rainy nighttime setting, the player travels through Hyrule Field and into e Castle Town as this moody piano piece plays. It'd be perfect if encounters with enemies didn't interrupt the theme, thus taking players out of the mood, but still, Midna's Lament is a beautiful piano melody that soothes and delights regardless. Another piano piece, but this time from The Legend of Zelda: Majora's Mask, the Song of Healing is a melancholic melody that is played when characters are restored to their normal selves throughout the game. If ever the word "beautiful" was to be used to describe a theme to its best ability, then using it for Majora's Mask's Song of Healing would be a proper time. The lone handheld-only theme on this list, The Legend of Zelda: Link's Awakening's Tal Tal Heights uses part of The Legend of Zelda main theme's motif to play off a fast-paced and infectious tune that is perfect for adventuring the titular area the song is named after. Nothing gets the excitement flowing through players like this sensational theme that uses the Game Boy's sound to fantastic effect. One of the only themes on this list that originated from the very first Legend of Zelda game, the Fairy Fountain theme, or also the main menu theme, is heard in pretty much every Zelda game. Each time it is brought brings a different iteration of the theme. My personal favorite is from Skyward Sword, offering an enchanting harp and gorgeous strings that touch the heart. Debuting in The Legend of Zelda: A Link to the Past, Kakariko Village has seen many manifestations throughout The Legend of Zelda series, most recently in A Link Between Worlds on the Nintendo 3DS. The only version of the song that is substantially different is in The Legend of Zelda: Twilight Princess, where the opening riff is based on the Kakariko Village's introductory motif before becoming an entirely different piece. When hearing the standard theme of Kakariko Village, one can't help but feel welcomed in the homey little community. My personal favorite version of Hyrule Field in any Zelda game, The Legend of Zelda: Twilight Princess's incarnation of Hyrule Field may not have an orchestral backing, but it still gives the feeling that you and Link are on a grand adventure. The part at 0:44 and again at 1:51 is as heroic as it gets. A magnificent part of the song that is a majestic as it is glorious. Of course, that part only plays when you're on the back of Epona, Link's trusty steed, so I always tried to ride Epona as much as possible since I'm such a sucker for this song. A very popular theme with Legend of Zelda fans, especially those who find the first 3D entry, Ocarina of Time, so endearing, Gerudo Valley gives a much different approach to what is normally heard on a Legend of Zelda soundtrack. Famed composer Koji Kondo delivers a catchy and remarkable flamenco-like theme to the desert canyon area of Gerudo Valley. The first time I heard this theme upon entering the valley, I was floored. I imagine a lot of first-time Ocarina of Time players were as well, showing why the theme is such a popular one. Like Kakariko Village. the absolutely phenomenal and heartfelt Zelda's Lullaby debuted in The Legend of Zelda: A Link to the Past. It was the theme heard when a maiden had been freed from her crystal prison. The Skyward Sword rendition is the best one yet, using soothing woodwinds for the main melody while being backed by sensational strings. It all adds up to a touching theme which one would have to have a heart of stone not to be affected by. What else could be number one than The Legend of Zelda series's most well known theme? Well, lots of songs, but that was a rhetorical question. One of the most beloved themes in gaming, The Legend of Zelda Main Theme is generally heard in one form or another in every Zelda game. That's 30 years of this heroic theme listened to in all of its glorious... well... glory! 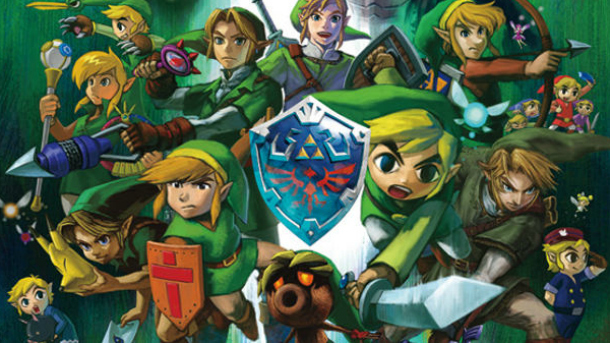 This particular version of the main theme comes from The Legend of Zelda: A Link Between Worlds. It's the second overworld theme, which begins to play normally after the Master Sword has been pulled from its pedestal.